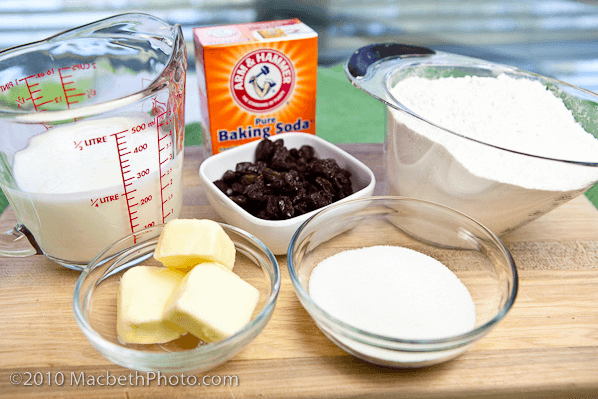 Here’s an easy step-by-step Irish scones recipe for making traditional Irish scones with raisins. 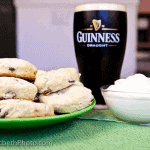 In honor of St. Patrick’s Day, I’ve resurrected this recipe from my old blog, Inn The Kitchen! 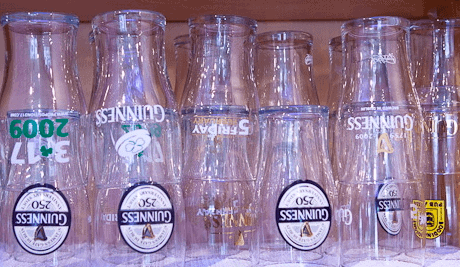 They’re perfect for celebrating a St. Patrick’s Day brunch, or curing a green beer hang over. 😉 Enjoy! If you’re the type that pulls out your green sweater and flips through your iPod to find some Celtic music to get into the spirit of things (eh uhm … I’m not describing myself at all), then this recipe’s for you. I researched to see exactly *what* makes them Irish and to be honest I couldn’t find anything definite. 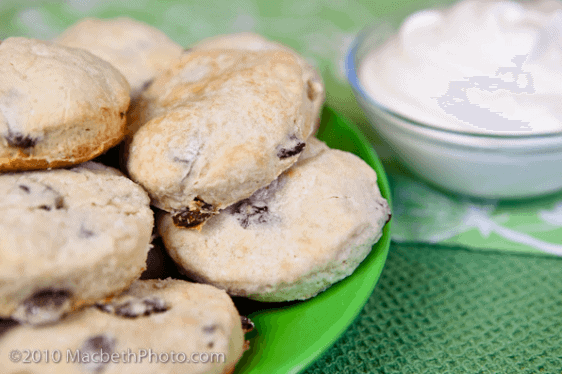 It’s debatable where scones historically came from, but most historic recipe sites agree it was Scotland. 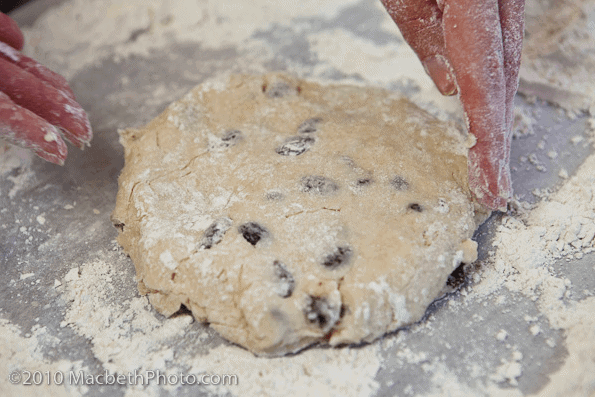 Scones are made with really basic baking ingredients you probably already have in your pantry. I would liken them to a sweet biscuit. Here’s the recipe with step-by-step photos. Add the butter in whole and “chop” it in. 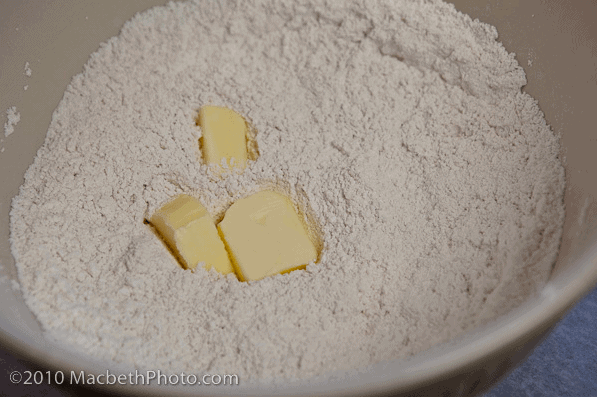 You can do this best with a pastry blender. 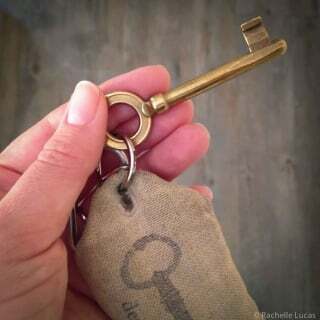 If you don’t have one, don’t sweat it. You can usually find one at your local supermarket. And who doesn’t love a reason to buy a fun new kitchen gadget? Or you can just use a fork. 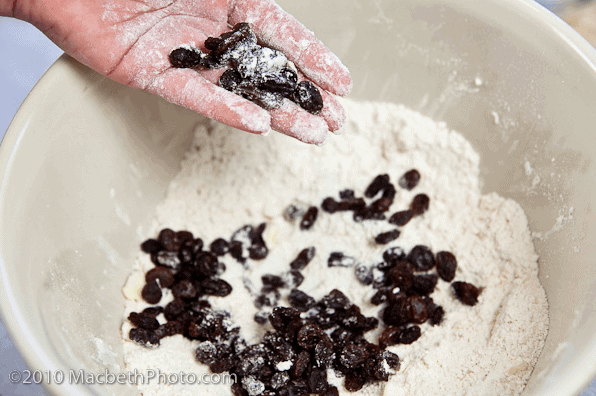 Add a handful of raisins. Looks like I added about 3 handfuls of raisins. What can I say, I like chewy bits. 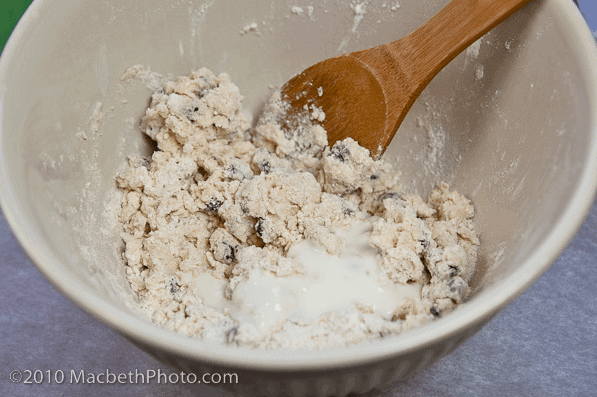 I’m the type of girl that whips her spoon around to dig all the “cookie” bits out of cookies and cream ice cream and leaves a puddle of melted dairy in the bottom of the bowl. I know I’m not the only one. 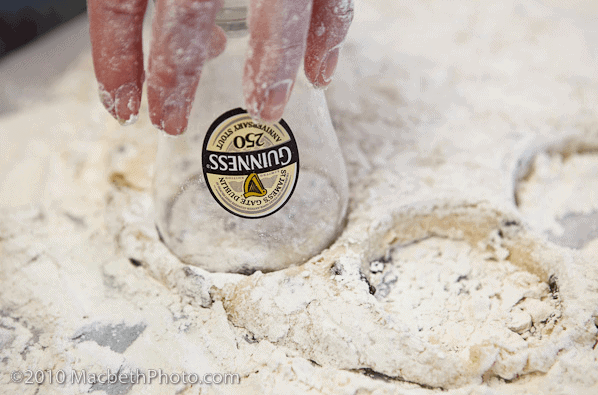 Pour in enough buttermilk to bind, about a 1/2 cup. The recipe’s measurement was “enough milk” so I had a whole cup on hand. Buttermilk is one of those baking wonders. If you’ve never baked with it before and now find yourself with a half a carton left in the fridge after making this recipe, it’s great for baking. 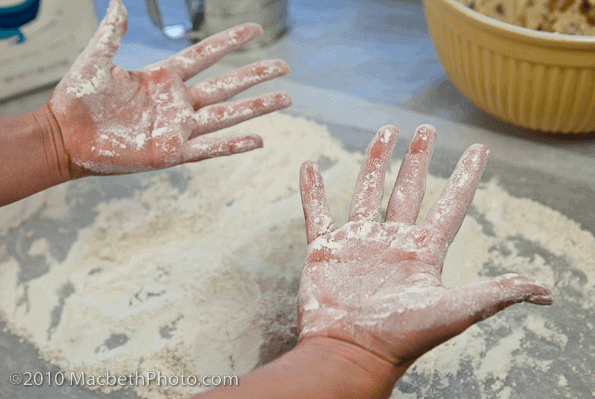 Just make sure to use a bit a flour so the dough doesn’t stick to your hands. 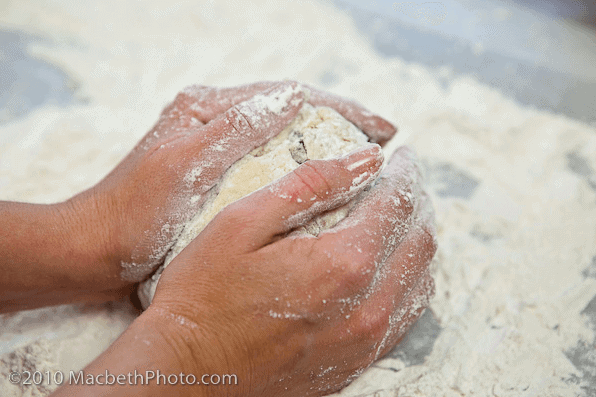 Mold the dough into a ball, and then flatten out like a disk. You could cut it like a pizza and make scone “wedges” which are a popular way to cut them as I did with the blueberry scones. However, we wanted to make it a little more fun. I asked the, Jim, the photographer, for a glass. He could only offer a pint. How appropriate! 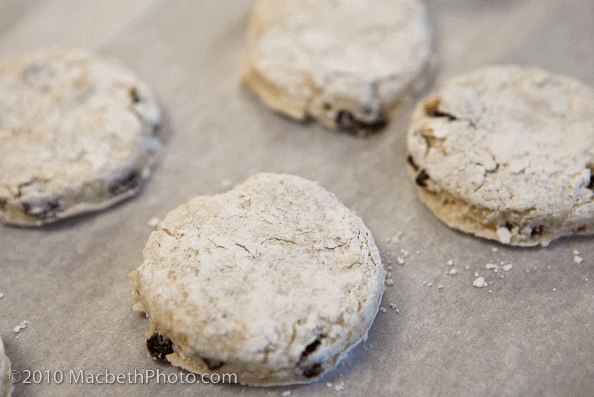 Bake your scones at 375 degrees for 10 to 15 minutes depending on your oven. They should rise up just a tad. 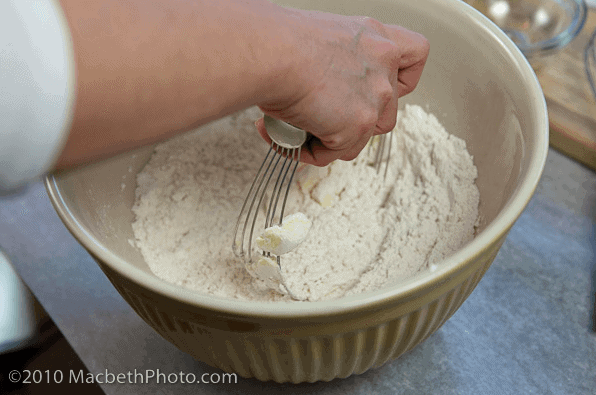 While the scones are baking, blend up a bowl of fresh whipped cream. 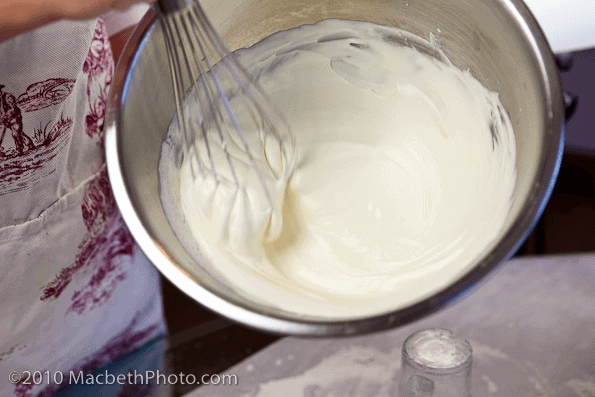 If you usually buy the canned stuff, you’re going to love how easy it is to make fresh whipped cream. It’s a great workout for your forearms, plus it tastes better. 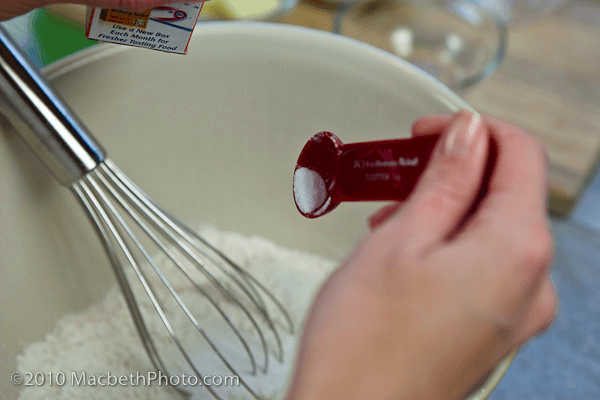 With nothing but a whisk and a sprinkle of sugar you can mix it into the softest, creamiest whipped cream you’ve ever had. 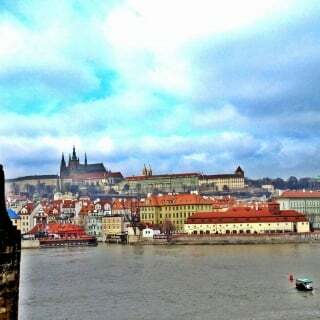 Now, I really love my scones with a cup of tea or hot coffee. But since my friends Jim and Beth only had English tea cups in their kitchen, we thought that would be sacrilegious. They’ve lived across the pond and swore to me that Guinness for breakfast is not just acceptable, but normal. 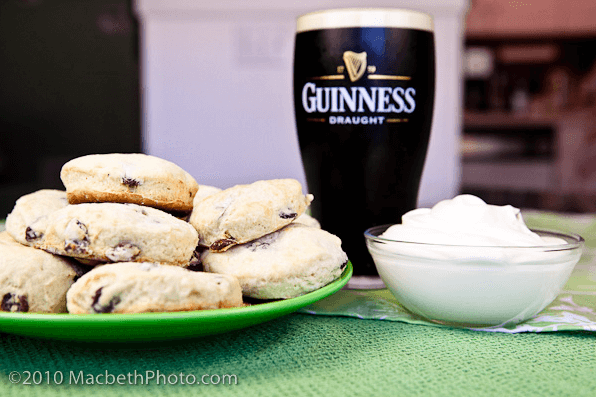 So, here’s a toast to a real Irish breakfast for St. Patrick’s Day. Cheers! 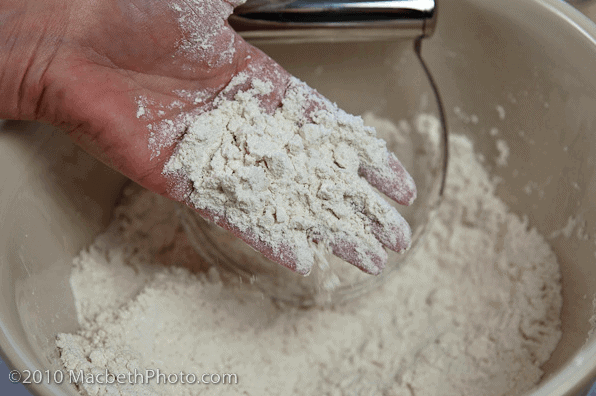 Chop butter into flour and work with fingers until it resembles breadcrumbs. 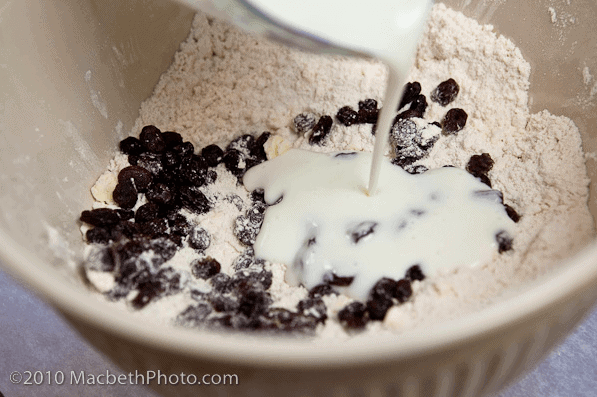 Add raisins and enough buttermilk to bind the mixture into a workable dough. 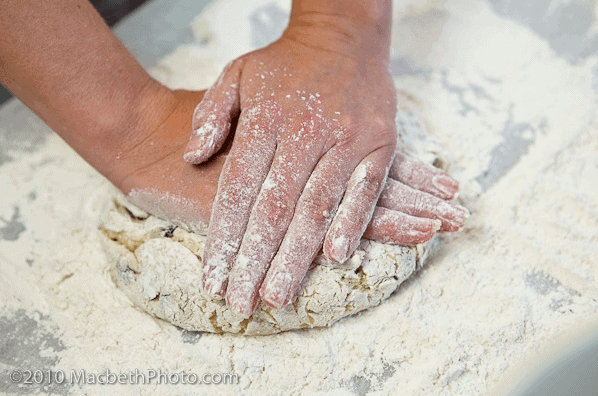 Form a ball and knead a couple of times. Roll out to ½ inch thickness. Cut with cookie cutter (or a glass) and place on baking sheet. Bake in oven at 375 for 10 -12 minutes. Serve with strawberry preserve and whipped cream.